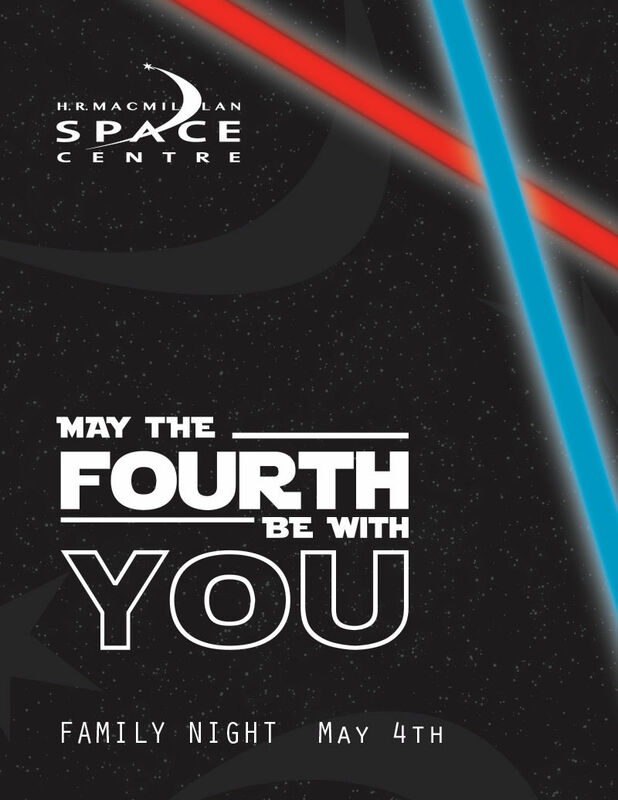 Join us for our first FAMILY NIGHT and enjoy the Space Centre after hours at this galaxy far, far away celebration “May the 4th Be With You”. Parents and kids are encouraged to come dressed as your favorite Rebel or Empire character. Enjoy a round of droid trivia, visit distant worlds beyond your imagination and make your own light saber. Vancouver’s 501st Legion Outer Rim Garrison will also be stopping by to hang out and take pictures. Droid trivia, make a light saber and enjoy “The Science of Light Sabers Fact vs Fiction” show in our Groundstation Canada Theatre. 9:00pm - 9:30pm – Stargazing - Take a look at the stars through our telescope. The observatory will be open weather permitting. This event is for ages 7+.